Campaigners have thwarted plans to build on the site of disused mill ponds. Developer Bloor Homes want to put up 28 flats and houses on land between Newsome Road, Hart Street and Naomi Road. But Kirklees Council’s Huddersfield Planning Sub-committee this week refused permission to develop on the Newsome Mills site after residents objected. Their complaints included loss of green space, possible flooding of basements and loss of habitat used by birds, bats and ducks. David Browning of Newsome Ward Community Forum told Thursday’s sub-committee meeting that the land would be better used as allotments. He said: “We’re looking for land where people can learn to grow food – demand for allotments far exceeds supply. 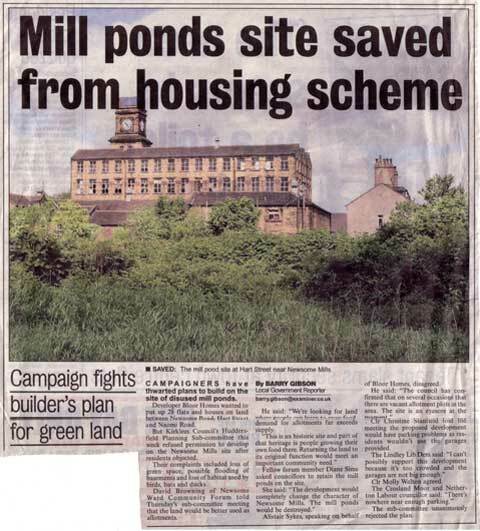 Fellow forum member Diane Sims asked councillors to retain the mill ponds on the site. Alistair Sykes, speaking on behalf of Bloor Homes, disagreed. Clr Christine Stanfield told the meeting the proposed development would have parking problems as residents wouldn’t use the garages provided. The sub-committee unanimously rejected the plan.